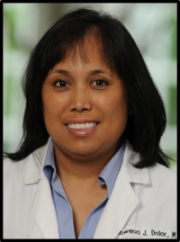 Site Investigator – Rowena J. Dolor, MD, MHS | Rowena Dolor is an Associate Professor in the Division of General Internal Medicine of Duke University School of Medicine. She is board certified in Internal Medicine and is Director of the Duke Primary Care Research Consortium, an AHRQ-registered practice based research network. She received her MD and Masters of Health Sciences (MHS) degree at Duke University and completed her internal medicine training and Health Services Research fellowship at Duke University Medical Center before joining the faculty at Duke in 1995. The focus of her research pertains to primary care clinical and outcomes research. She is an investigator of several federally-funded projects conducted in the community-based setting on hypertension, diabetes, patient-provider communication, immunization, osteoarthritis, prevention screening. 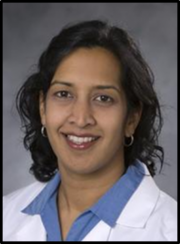 Site Investigator – Ranee Chatterjee, MD, MPH | Ranee Chatterjee Montgomery, MD, MPH, is Assistant Professor in the Division of General Internal Medicine of Duke University School of Medicine. She is board certified in Internal Medicine, has a clinical research focus in diabetes prevention, and is an active member of the American Diabetes Association. She received her MD at Duke University and her internal medicine training at Johns Hopkins University and Hospital. After several years of clinical practice, she returned to academia and received her MPH from Emory University and did a clinical research fellowship at Johns Hopkins. Her research focus has been related to diabetes prevention, and she is well-published in the area of novel risk factors of diabetes. She joined the faculty of Duke University in 2011 where she works clinically and does research with Duke’s Primary Care Research Consortium, an AHRQ-registered practice based research network. 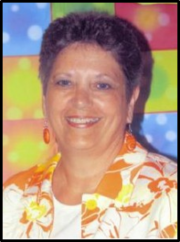 Site Research Coordinator – Kathy Chmielewski, CMA (AAMA), CCRP | Kathy has been a member of the Duke Primary Care Research Consortium/Duke Clinical Vaccine Unit for the last 14 years and has been a Clinical Research Coordinator for the group for the past 4 years. She is certified as a clinical research professional (CCRP) through the Society of Clinical Research Associates (SoCRA). Kathy has research experience working on both government and industry sponsored studies in a variety of clinical areas. These have included adult and pediatric vaccine studies as well as studies involving adults in primary care clinics. Most recently Kathy has been the study coordinator for the Duke site for the NIH sponsored PROMISE study. Kathy is excited about the D2d study and looks forward to working with subjects with pre-diabetes.